Whether you’re ready to sell or not, every CEO of a growing company wonders about valuation and how it may impact his exit options. Determining the value of a business can be an opaque and somewhat subjective process. It is important as a seller that you understand how to approximate what your business is really worth to both manage your own expectations and help bankers and investors see the value of your company. 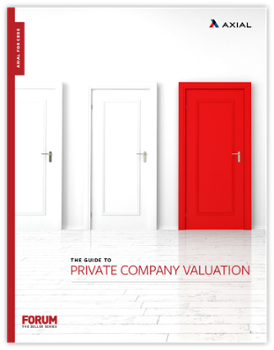 Consider this your guide to understanding how private companies are valued by private equity groups (PE) and potential investors. We’ll take a look at the two types of acquisitions – platform and add-on – so you’ll understand how your company’s value can differ based on the views and goals of deal participants. Then, we’ll discuss the need for both qualitative and quantitative valuation methods and dive into the most common quantitative models. Finally, we’ll give you the tools you need to prepare for valuation discussions and effectively articulate the value of your own company.